Livestock exhibitors from across the UK will be at the East of England Showground, Peterborough on 5th & 6th December as the 2013 East of England Smithfield Festival is once again set to be one of the largest gatherings of prime livestock in the UK. The hotly-contested classes will see cattle and sheep from leading farms go head to head for the prestigious Smithfield Championship titles. Over 180 commercial cattle will kick off the first day of judging, with the Limousin breed leading the way again in the cross-bred beef classes, closely followed by British Blue crosses. More than 200 sheep have been entered to date. 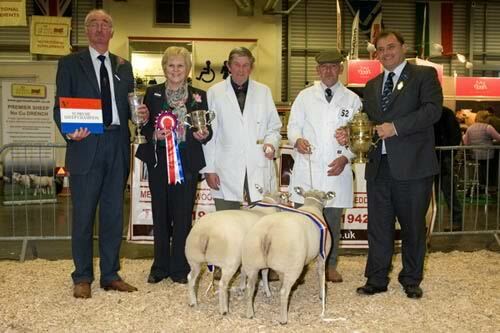 Strongest entries are from the Beltex in both the trimmed and untrimmed classes with a similar strong entry for the Southdown’s in the native classes. This will ensure the judge is kept busy throughout the day. Alongside the main judging rings will be 21 lamb carcasses and beef ribs. Carcases, ribs, cattle and sheep will all be up for sale on the last day of the show. Once again the ever popular pedigree calf shows will host to over 200 calves from eight breeds: Aberdeen Angus, Beef Shorthorn, Simmental, Red Poll, Lincoln Red, Charolais, South Devon and new for this year the Limousin's. All breeds will take part in an overall calf interbreed in the main cattle judging ring on the Friday. As always the pinnacle of the show is the sale of the Smithfield Champions. Once again, Newark Livestock Market are the official auctioneers for the sale of cattle, sheep, carcasses and ribs.